Many of our customers’ frequently asked questions have been compiled into a user friendly list here. Before your party, please review our terms below. How do I book/pay for a party? Parties are booked on a first come first serve basis. We suggest booking a month in advance, but can usually accommodate booking even up to only a week in advance. In order to reserve a date, first contact us to confirm the date is available. Once we confirm the date is available, a deposit of $50 is necessary to secure your date. Following that, the balance will be due the day before the party. We use Square invoicing and you will receive an invoice via email in which you pay via credit card. Special arrangements can be made if you need to pay in cash. Checks not accepted. We serve East Baton Rouge and surrounding parishes. Travel fees apply for any distance greater than 30 minutes from LSU. How many children can one performer entertain at a party? In order to give each child attention, we suggest that you have up to 10-15 children per performer. If you plan on having more than 15 children, we recommend adding on another character. What time should I schedule the performer to arrive at the party? We suggest scheduling the character to appear at least 30 minutes to an hour after your party STARTS, this way all the guests have the time to arrive and can enjoy the performance. Please urge your guests to arrive on time. It is very important that we begin on time so that we can keep an on time schedule for the other parties that day. We cannot go back and repeat activities for the late arrivals. Do you have to tip the performer? You are not required to tip our performers, but it is greatly appreciated! If you do feel our performer is deserving of a tip, the amount is completely up to you. We recommend a standard gratuity based on the total party amount of 10% to 20% at your discretion. Also note that our performers receive a small bonus from our company if they receive a positive review/recommendation on Facebook for their performance. Can I request a specific cast member for my party? While we CAN guarantee your character selection, we do NOT guarantee cast members. Our cast members are assigned to certain characters and we also arrange their schedules weeks in advance based on their availability. If you request a specific cast member, we will try to accommodate you, but again, it is NOT a guarantee. Your deposit secures your desired date and time. In the event you have to cancel we will retain your deposit or gladly work with you to find an alternate party date (based on availability). Alternate party dates must be scheduled within a 6 month period. What if my princess does not show up? Our cast members are extremely reliable and make EVERY EFFORT to arrive at your party on time and ready to perform. If, in some rare circumstance, a weather event, car accident, extreme illness or other Act of God prevents them from appearing, you will be given a full refund. We take our jobs very seriously and know how important your child’s dreams and your expectations are! Yes…The Petite Princess Company is a fully insured LLC. In addition, our performer will do everything in her power to ensure that your home and guests are treated with the utmost care and respect. The safety of our performers and your guests are our top priority. We ask that party guests refrain from smoking in the area of the performers due to allergies and smoke damage to our gowns. We also ask that all pets should be on a leash or penned during the princess visit. If at any time our performers feel threatened, harassed or unsafe at a party, they reserve the right to leave the premises. Preferably at your home pool or another private residence with a pool. We can discuss the possibility of having it in a public pool, however, these don’t usually work out as well because other kids tend to “crash” the party and want attention from the mermaid. 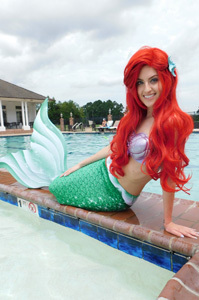 Our mermaids are contracted to provide fun party entertainment for your child. We suggest a 10:1 ratio for entertainment purposes. If your party will have more than 10 children, we suggest adding an additional mermaid ($100). WE ARE NOT certified lifeguards and are absolutely not liable for the safety or supervision of the children in the pool. This cannot stressed enough. All children must be supervised by adults. Life vests and floaties encourages for small/weak swimmers. If at any time children become rowdy or unsafe in the water, the mermaid will exit the pool. The mermaid is required to exit if thunderstorms enter the area. Children are welcomed to swim along with the mermaid and closely interact with her. However, for safety reasons, please encourage children not to hang on the mermaid or attempt to “ride” on her back. This can cause a drowning hazard.